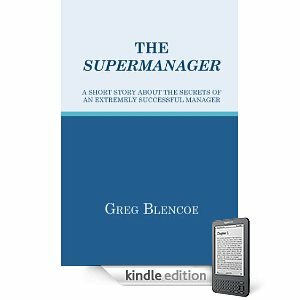 The book of the week is the Supermanager by Greg Blencoe. This is going to be a short post because the ideas speak for themselves. This book is very simple, but very right. Blencoe gave me the opportunity to read over this book a couple months ago and I liked it just then, before it was published, as I do now. The book is similar to the 1 Minute Manager type books. It has a story and ultimately reveals the simple truths the protagonist becomes aware of along the way. I'll leave the story to your own reading, it's quite good. What I would like to cover is the 7 pieces of information you need to know to become a Supermanager. 1- Surround yourself with high-quality employees- This is so incredibly important. Your organization is defined by it's people. Once you hire people with the right attitude, the next 6 ideas are all downhill. 2- Train employees well- This is basic, but missed a lot. Train your employees to be the best if you expect them to be the best. 3- Communicate the end result you want, then empower employees to achieve it- People want to be empowered! If you give them that responsibility you will be surprised with the results. 4- Lead by example- It is imperative that your employees know they are working for someone that cares as much as you expect them to, so show them you do. Work like you want them to work, speak like you want them to speak, and think like you want them to think. 5- Listen to employees- The number one incentive for people is attention. So if you want to give your people incentive to work hard for you, give them attention and that includes listening to whats going on in their personal life as well as the struggles they are facing professionally. 6- Praise good work- Just like number 5, but instead of just lending an ear as a form of attention you are acting on it. Saying "Good job" or "Nice, that's exactly what I would have done" has great impacts on your people. 7- Manage each employee differently- No one is a robot. You have to manipulate your style to match what works for each particular employee. If you treat them like they are all the same you will not get optimum results. These fundamentals for management are about as solid as you can get. They should have college courses dedicated to just cover these 7 ideas. These are incredibly important. As always, if you have any questions don't hesitate to ask! Thanks so much for writing this review of "The Supermanager" on your blog. I really appreciate the kind words! I actually just found out about this post an hour or two ago while doing a Google search. I see that this was written in May 2011, so my apologies that this thank you is over a year late! Thanks again for reviewing the book before it was published. Your feedback on the book and encouragement definitely motivated me.